Precision reports enable you to create perfectly aligned output for a preprinted form, such as a Bill of Sale or Shipping invoice. The Precision Report tool enables you to build an exact layout for a form by embedding data in headings and text objects, managing images, and drawing objects to fit specific positions. The Precision Report tool is accessible from Report Painter. Note: Precision reports are available for PDF, DHTML, and PS output formats. You can build the report in Report Painter and click the Precision Report button. The report then becomes a precision report. In order to create a new Precision Report, you are required to build a report in the Data Matrix and add fields as objects in the Headings/Footings of the layout. The Data Matrix Layer inserts a placeholder for the reporting data. Within the Data Matrix, the behavior is identical to creating a report in Report Painter. The Heading and Footing Layers enable you to build objects and embed data as variables. These objects are used as fields on your form. When you run the Precision Report, these fields are populated with the results of the report that you created in the Data Matrix. The following image is an example of the Precision Report tool. 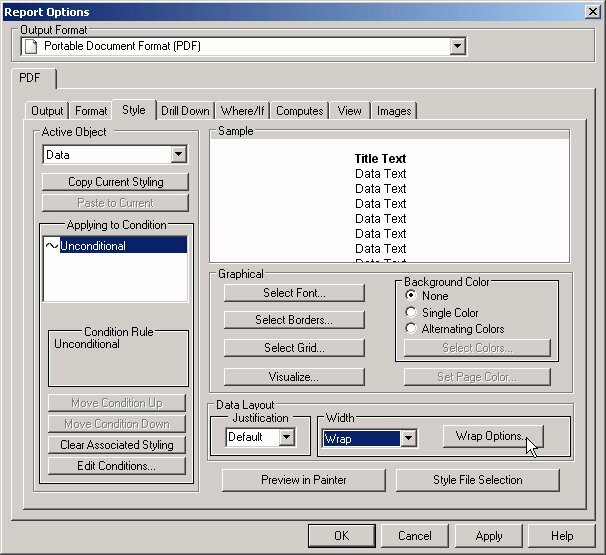 The following image is an example of the Precision Report output in PDF format. The Precision Report tool is accessible from the Report Painter General toolbar. You may convert an existing report to a Precision report, or create a new one. Note: Once a Precision Report has been saved, it will automatically open in the Precision Report tool. The Procedure Viewer opens. If the original procedure (.fex) was created by specifying Create with Report Painter, Procedure Viewer will not open. The report opens in Report Painter. Click the Precision Report button located on the General Toolbar. A Style warning message appears indicating that the report will be converted to a Precision Report. Click YES to convert the report. Click NO to remain in Report Painter. The existing report is converted to a Precision report. You may edit the existing data and change the alignment and position of the objects in report. Note: The report output will automatically change to PDF output in the Precision Report tool. Optionally, you may select DHTML or PS as the output format. Your report is using a locked format that is not supported by Precision Report. Report Heading and Report Footing will not convert to the Precision report. Note: You can create a Report Heading Layer and Report Footing Layer in the Precision Report tool. The SubHeading and SubFooting will convert to the Precision Report, including the Alignment Grid options set in Report Painter, and will be editable in Data Matrix Layer of the Precision Report tool. Reports with images, parameters, and drill downs will convert to the Precision Report, but will not be editable in the Precision Report tool. Create a new procedure (.fex), or open an existing procedure. Click the yellow diamond and select Report from the Component Connector toolbox. The Open dialog box appears. Select a Master File and click Open. Select Precision Report , located on the General Toolbar. The report is converted to a Precision report. You may build the report and add fields as objects. For details on how to build a Precision report, see Creating Precision Reports. The Precision Report layout is similar to the Report Painter layout with additional Tools and Palettes, enabling you to design the exact layout of your preprinted form. The layout of the Precision Report tool is a grid that contains a placeholder for your report (the Data Matrix). You can snap objects (such as lines, images, and so on) to the layout. These placeholder objects can be positioned and aligned according to the layout of the items on your preprinted form. The Precision Report Tools box contains buttons that provide quick access to commonly performed functions that you may use in the Headings and Footings of the Precision Report layout. Headings and Footings enable you to create fields using variables from the reporting object (the Data Matrix). The behavior of the tools options are determined either by the selected object or the previously performed command or action. Therefore, depending upon your location in the Precision Report tool or previously performed actions, certain tool buttons may be inactive. 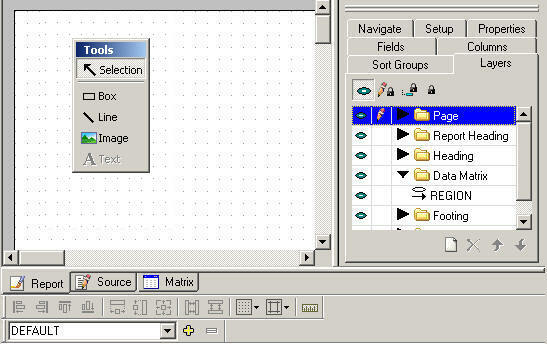 The Precision Report Tools box is displayed in the layout. You may move the Tools box. The following table lists and describes the objects in the Precision Report tools box. The Selection button indicates that the items in the Data Matrix, Headings, and Footings can be selected. Tip: Click the Selection button after inserting a box, line, image, or text to return to select mode. Inserts a box in the Heading or Footing layer. Note: When you select the Box object from the Tools box, the Box toolbar appears with options to set the pen size, line style, fill color, and line color. This sets the box options until you change them again. The cursor changes into a crosshair. Click and drag the crosshair on the canvas to create the box object and adjust it to the size you want. Inserts a line in the Heading or Footing layer. Note: When you select the line object from the Tools box, the Line toolbar appears with options to set the pen size, line style, and line color. This sets the line options until you change them again. The cursor changes into a crosshair. Click and drag the crosshair on the canvas to create the line object and adjust it to the size you want. Inserts an image in the Heading or Footing layer. The cursor changes into a crosshair. Click and drag the crosshair on the canvas to create the image object and adjust it to the size you want. Select the image from the Open dialog box. Inserts text in the Heading or Footing layer. Note: When you select the text object from the Tools box, the Font toolbar appears with options to set the font type, size, color, and text formatting. This sets the font options until you change them again. The cursor changes into a crosshair. Click and drag the crosshair on the canvas to create the text object and adjust it to the size you want. Enter the text, or embedded field, as the input field for your form. For more information about using these objects in Headings and Footing, see Creating Precision Reports. Alignment options enable you to multi-select objects and easily position them relative to one another. These options are available from the Alignment toolbar in the Precision Report tool. Note: You may only align objects that are in the same layer. For example, you may align multiple Heading objects, or multiple Footing objects but you may not align Heading and Footing objects. The behavior of the Alignment buttons are determined either by the selected object or the previously performed command or action. Therefore, depending upon your location in the Precision Report tool or previously performed actions, certain Alignment buttons may be inactive. The Alignment toolbar is displayed in the layout by default. You may move or hide this toolbar. Tip: Select Alignment from the View/Toolbars menu to view or hide the Alignment toolbar. Aligns objects to the left. Aligns objects to the right. Aligns objects by the top of the highest selected object. Aligns objects by the bottom of the lowest selected object. Makes two or more objects the same width. Makes two or more objects the same height. Makes two or more objects the same size. Spaces evenly across for the objects selected. Tip: To select multiple objects, use the Shift key. Spaces evenly down for the objects selected. Shows or hides the grid in the Precision Report layout. Snaps or unsnaps the objects to the grid. Shows or hides guides in the Precision Report layout. Snaps or unsnaps the objects to the guides. Note: These options are applicable when the page ruler is on. Toggles the page ruler on or off in the Precision Layout tool. Composition options enable you to create composition templates that run the same Precision report with different properties. This may be beneficial if you need to run a Precision report with modifications for internal and external use. These options are available from the Composition toolbar in the Precision Report tool. The Composition toolbar is displayed in the layout by default. You may move or hide this toolbar. Tip: Select Composition from the View/Toolbars menu to view or hide the Composition toolbar. The DEFAULT composition shows the original Precision report and cannot be deleted. Add Composition enables you to create a composition template. Remove composition deletes the composition template from the selection list. For details on how to use compositions, see How to Run Different Compositions for the Precision Report. There are several palettes that appear in the Precision Report layout. These palettes enable you to design and create positioned elements for your report. The Layers palette is the main palette where the Data Matrix, Heading, and Footing layers are created. The Precision Report palettes are displayed in the layout by default. You may move or hide these palettes. Tip: Select Palettes from the View menu to view or hide the Precision Report palettes. Note: The arrangement of the palettes may appear differently, depending on which palette was selected last. The Layers palette consists of the Page, Report Heading, Heading, Data Matrix, Footing, and Report Footing layers by default. Shows or hides the selected layer in the Precision Report layout. Enables or disables styling changes. Enables or disables data changes. Enables or disables all changes. Creates a new layer for the Precision Report. Note: If any layer is deleted, the option is available to create the layer from the Create new layer icon. Deletes the selected item and all of its layers. Moves the selected item up or down in the selected layer. You can view and modify the sorting properties of fields in the Data Matrix from the Sort Groups palette in the Precision Report tool, as shown in the following image. The Sort Groups palette displays the sorting method being applied to each column in the Data Matrix window. You can change the sorting method (for example, from By to Across or from Detail to Sum) by using the right-click context menu. The changes are reflected in the Columns and Sort Groups palettes and in the Data Matrix window. You can also use the Sort Groups palette to create multi-verb requests. For more information, see Sorting in Groups to Create a Combined Detail/Summary Report. You can view and modify the columns in the Data Matrix window from the Columns palette in the Precision Report tool, as shown in the following image. Right-click a column and select Options from the context menu to opens the Field Properties dialog box, where you can format and style your column, as well as apply drill down capabilities. Any changes made to the column properties are reflected in the Data Matrix layer. Tree separated by segments (the Field Tree). List of fields (the Field List). Tree separated by Dimensions (the Dimension Tree). You can double-click or drag segments or fields from this palette to the Data Matrix window, where they become report columns. You can customize how you view the fields list and save your settings. You can also search for fields in the fields list. When you select an attribute object or layer, its properties are reflected in the Properties palette in the Precision Report tool, as shown in the following image. To edit properties, there are drop-down lists, input fields, and Yes/No options in the value column. Click the symbol to edit the property. Click a component in the Setup palette to open the tool that created the component. Right-click a component in the Setup palette and select Hide Details section to display the syntax for that component in the Precision Report tool. You may view the entire layout of the Precision Report in the Navigate palette. The slider bar enables you to increase or decrease the zoom percentage of the layout. Click and drag the orange box in the Navigate palette to view different elements of the Precision Report in the layout, as shown in the following image. For more information about using these palettes in the Precision Report layout, see Creating Precision Reports. The Precision report is created by using the Data Matrix as the reporting object, and by inserting objects in the Headings/Footings layers as fields. Click REGION under the Data Matrix layer. Note: REGION displays as a placeholder for the Data Matrix object regardless of which Master File you use and what fields are selected. The Data Matrix object is shown in the layout, as shown in the following image. Double-click the Data Matrix object in the layout. A hand displays in the Data Matrix enabling you to begin building or editing your report, and the basic Report Painter functions are enabled, as shown in the following image. Click the Fields palette to select the sort fields for the report. If the fields are sort fields, you need to click the By button before you add the fields, as shown in the following image. Style your report as you would in Report Painter by using the right-click and/or toolbar options. Click Save from the File menu to save the report in the Data Matrix. Note: You may resize the Data Matrix placeholder at anytime in Selection mode. Once the report has been built in the Data Matrix, you may design the page layout for the Precision Report. Objects added to the page layout appear on each page of the form at run time. From the Layers palette, click the Page layer to toggle to edit mode. 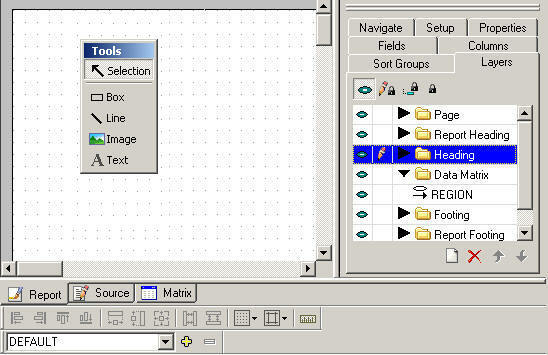 The Tools objects are enabled, as shown in the following image. 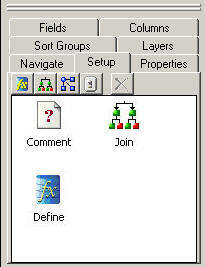 To set the default box settings, select the box object from the Tools box to view the corresponding options. The following image shows the toolbar that appears underneath the Alignment toolbar when the box object is selected. Set the pen size, line style, fill color, and line color for the box object. This sets the box options until you change them again. To set the default line settings, select the line object from the Tools box to view the corresponding pen options. 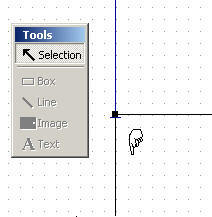 This toolbar appears underneath the Alignment toolbar when the line object is selected, as shown in the following image. Select the box, line, or image object from the Precision Report Tools box. Note: The Text object is not available for the Page layer. The cursor changes into a crosshair. Click and drag the crosshair on the Precision Report layout to add the object and adjust it to the size you want. Note: Objects snap to the grid for perfect alignment. As items are added to the page layout and appear under the Page layers, as shown in the following image. Optionally, you may use the Layer options to delete or move the Page layer objects. Tip: Once the line object has been added to the Page layer, you may use the Properties palette to change the pen options. When you run the report, the items added to the Page layer appear on every page of the report output. Once the report has been built in the Data Matrix, add Heading and Footing objects as placeholders for fields on your form. From the Layers palette, click the Heading, Footing, Report Heading, or Report Footing layer to toggle to edit mode. To set the default box, line, or text settings, select the object from the Tools box to view the corresponding pen or font options. These toolbars appear underneath the Alignment toolbar when the box, line, or text objects are selected. Select an object from the Precision Report Tools box. As items are added, they appear under the Heading/Footing layers, as shown in the following image. Optionally, you may use the Layer icons to delete or move the Heading/Footing layer objects. You may embed fields and variables in your Heading/Footing layers as text objects. The Precision Report retrieves the value for the field when the report is run. Note: If adding embedded fields, values are calculated differently in Heading and Footings. Headings use the first value on the page of the report, and Footings use the last value on the page of the report. Place the cursor in the text object where you want to embed the value. Double-click a field from the Fields palette in the Precision Report tool. This includes Report Variables, Computed, and Defined fields. The field is added to the text object as <FIELDNAME. Highlight <FIELDNAME in the text object. Right-click and choose Prefix Operators and the desired operator from the context menu. Tip: The list of available operators adjusts to show those that are appropriate for the type of field you select. You can use the WrapGap option in a style sheet to control spacing between wrapped lines in PDF and PostScript report output. The WrapGap option is available for only an active object of type Data. Click the Options button from the Output Format Toolbar. Click the Style tab and select Data under the active object drop-down list. Click Wrap in the Width drop-down box under the Data Layout section. The Wrap Options button displays next to the Width drop-down box. Click the Wrap Options button and click the ON radio button under the WrapGap section. Type the number of inches to leave between wrapped lines. Click OK to exit the Wrap Options dialog box. You may run the Precision report with different composition templates. Composition templates enable you to run the same Precision report with different properties. This may be beneficial if you need to run a Precision report with modifications for internal and external use. For example, you have an internal report that shows your trademark image in the Report Heading Layer. You can create a composition template that hides your trademark image for an external customer. Click the Add Composition icon from the Composition toolbar. The composition selection list creates a template name, as shown in the following image. Type a name for the composition or use the default provided. From the Precision Report Properties palette, change the desired options. For example, in the Properties palette below, the Visible property for the image object was changed to No, thus removing the image from the layout. The composition template is added to the composition selection list. As per this example, the composition template saved hides the image in the Precision report. Select the composition name from the drop-down list. Click the Remove Composition icon from the Composition toolbar. Note: The DEFAULT composition cannot be deleted. A confirmation message appears indicating that the composition template will be deleted. The composition template is removed from the composition selection list. Select the composition template from the composition selection drop-down list, as shown in the following image. The Precision report runs with the values specified in the Properties palette for the selected composition. 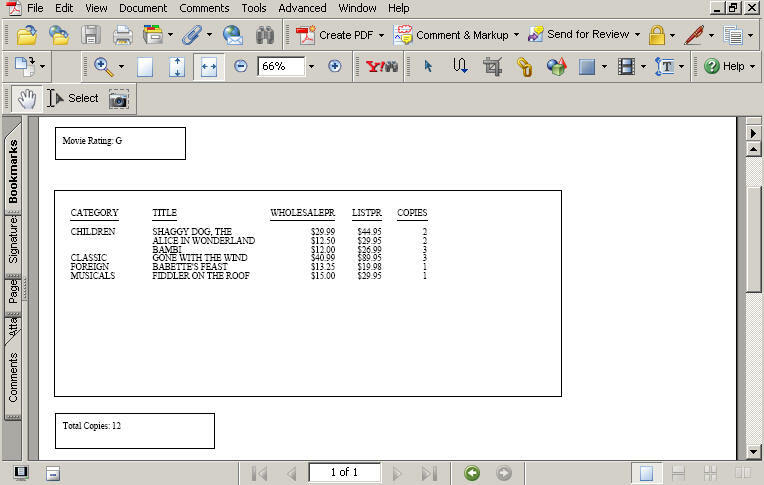 The following example shows how to create a form by Ratings and Total Copies for Movies. From the Procedure Viewer, create a new report using movies.mas as the data source. Click Precision Report located on the General Toolbar. Click REGION under the Data Matrix layer in the Layers tab. The Data Matrix object is selected in the layout. Click in the Data Matrix object to begin building your report. Click the By sort field from the Columns toolbar and select CATEGORY from the Fields palette. 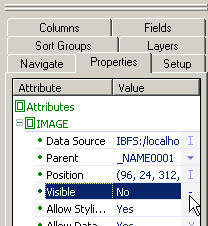 Select the space after the Category field and click the Detail sort field from the Columns toolbar. Select TITLE, WHOLESALEPR, LISTPR, and COPIES from the Fields palette. The fields are added to the Data Matrix. Note: Not all fields may be visible in the layout. Use the Navigate palette to view all pages and fields in your layout. Select the Where button from the Where/If from the Columns toolbar. Type RATING EQ 'G' in the Advanced section. Click the Columns palette and double-click the Title field. The Field Properties dialog box appears. Click Minimum from the Column Layout Width drop-down list. Click OK to close the Field Properties dialog box. All of the fields should now be visible in the layout. Click and drag the Data Matrix placeholder to shrink the size of the object in the layout. Click the Page layer from the Layers palette. You may add a box, line, or image element to the page layer. Click Box from the Precision Report Tools box and click the drag the box element around the Data Matrix. Click the Heading layer from the Layers palette. 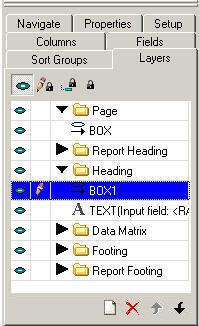 Click Box from the Precision Report Tools box and click the drag the box element above the Data Matrix. Click Text from the Precision Report Tools box and click and drag the text element within the box object. Type the text Movie Rating: and double-click RATING from the Fields palette. Movie Rating: <RATING is added as the embedded field in the text element. Click Box from the Precision Report Tools box and click the drag the box element below the Data Matrix. Type the text Total Copies: and double-click COPIES from the Fields palette. Total Copies: <COPIES is added as the embedded field in the text element. Select <COPIES, right-click and select TOT from the Prefix Operators list. Total Copies: <TOT.COPIES is added as the embedded filed in the text element. Save and run the report. The form appears, showing the total copies for movies with a G rating, as shown in the following image.